One of only three people to be allowed the title of Jeet Kune Do teacher by Bruce Lee was Filipino-American Grandmaster Dan Inosanto. He was a close friend of the legend, was his main training partner and one of the few people who had earned both lee’s respect and trust. Dan Inosanto has kept Bruce Lee’s philosophy alive for 45 years. in 1964, he was the person who handed Bruce his first nunchaku. 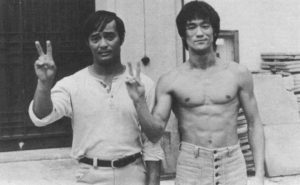 “At the time, he thought [it] was a worthless piece of junk,” “In three months, he was swinging it like he’d been doing it for a lifetime,” says Inosanto. There have been countless films, documentaries and books about the legend, but none are complete without the input of the man who knew him and his techniques the best. “Well, without the Yip Man, then there would never been Bruce Lee and without Bruce Lee, there’d never been Jeet Kune Do. So I think it’s important to take the knowledge of the past and try to improve it. Those guys paved the way and without them, we would not have reached the levels that we are now and I think that’s why in the Asians society that did they looked up to the instructors so much. I trained further with the Wing Chun people because I really wanted to see how Wing Chun was taught. So I trained. I have nine Wing Chun teachers, James Lee makes eight and Bruce Lee makes nine. He was young, talented, wise for his age. The Bruce Lee at that time period, he might be a little bit on the cocky side at that time period but he was definitely well-schooled and knowledge beyond his years. He had a high respect for Yip Man but I was told because he wasn’t pure Chinese, that sometimes he didn’t want to teach Bruce Lee in front of students. So he assigned William Cheung and Wong Shun Leung to teach him. Then as time went on, when he came to the United States, he started to evolve on his own but he had a high respect for Yip Man. There was, definitely could see a love there. He knew there was a certain range where Wing Chun worked very effectively and he knew there was a certain range that Wing Chun didn’t work. So Wing Chun works really well in a bathroom, small places. If you have the space of a football field and there might be as many as three or four or five people, then maybe another structure might work. So he had a system that worked on the outside where you can sort of hit and go. He developed a system what he calls “Chi Sao without touching.” He started to put what worked for him and that became the structure of his personal Jeet Kune Do but Wing Chun is still the core. You still start with it and I think it’s knowing when that material is applicable and when it’s not but definitely, it should be taught. That should be part of the education. The sensitivity you see from Chi Sao, the trapping I think is very good, and the short-range punching definitely should be taught. But I can’t really agree that it would be the only system that you can use but it could be a system that might throw a system off that’s not used to that type of structure. I liked it you know and when you study something, sometimes you go away from it and then you come back to it with new eyes, but definitely I think it’s a real great system. When he first came to the country, he could win everything by via the Straight Blast or what they call the ‘Jik Chung Chuie’. As time went on, he changed that thought process and he started to research you know and experiment and after that, he would create. So a lot of that material I think was being changed almost and I’m not exaggerating when I said on a monthly basis. He was always changing the structure, always refining it and making it more functional. That’s what he was trying to educate me and said you can’t really follow a particular way. You have to find out what works for you. That’s Jeet Kune Do.